OPPO Reveals the Selfie Expert's F1s Limited Edition and New Endorser Alden Richards! The guessing game is finally over. After several days of waiting and speculation on social media, mobile technology brand OPPO finally unveiled the ‘new face of the selfie expert’—the special edition F1s Limited that sports a metallic grey color. But the F1s Limited is not only OPPO’s new face. The smartphone brand also confirmed today that Kapuso heartthrob Alden Richards is joining the OPPO family as one of its new brand ambassadors. The F1s first made waves among Filipino smartphone users last August. The new smartphone was such a hit that more than 19,000 units across the country sold out in just three days after its debut. 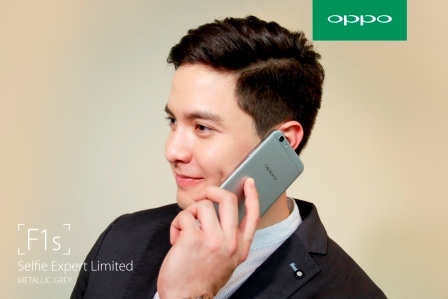 Alden Richards expressed his excitement to work with OPPO, the Philippine’s second bestselling smartphone brand according to a report by German-based market research firm GfK. “Selfies capture life’s most unforgettable moments in a very spontaneous way. I’m proud to be part of a family that celebrates those special moments,” Richards shared. Richards is the other half of the phenomenal power couple AlDub, who stars in a segment of long-running noontime show Eat Bulaga. The love team generated a record-breaking number of tweets last March in one of their episodes, a feat recognized by the Guinness World Records during the tenth anniversary of micro-blogging site Twitter. Nicknamed the ‘selfie expert’, the OPPO F1s has a 16-megapixel front-facing camera that can snap bright selfies even in dim light thanks to its large aperture. It also helps users achieve a flawless look through its upgraded beautifying app, Beautify 4.0. Apart from static selfies, the F1s can create moving images using its Super GIF feature, as well as double-exposure shots that juxtapose two images in one photo to create a sense of motion. Lightning-fast fingerprint recognition also unlocks the phone in 0.22 seconds. Five fingerprints can be assigned to five contacts or applications for quick access.